Husband and wife design duo Jon and Maša Kleinhample drew on dinner parties held in their Belgium home to create the homey aesthetic of this restaurant in Los Angeles. 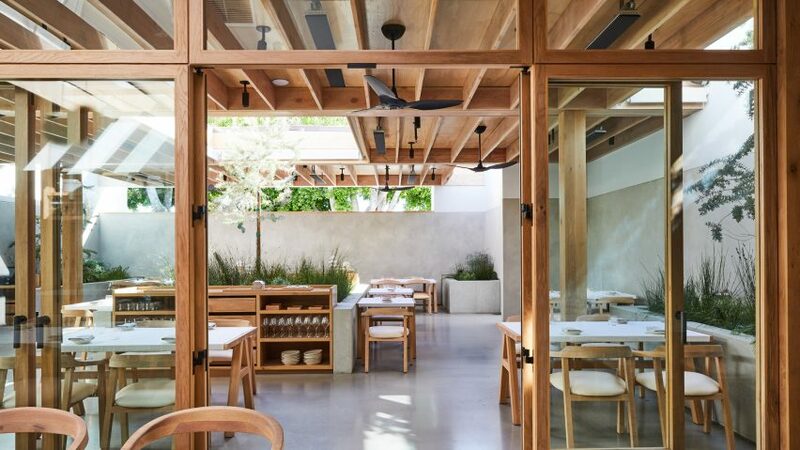 Auburn is a fine-dining restaurant located on Melrose Avenue, in a space that has been home to a number of famed eateries, including Michel Richard's Citrus. Chef Eric Bost enlisted local architect Oonagh Ryan to reconfigure the space and the Kleinhamples, who run local studio Klein Agency, to oversee the interior design. The 105-seat eatery is intended to provide the experience of eating at home, drawing on the numerous dinner parties that the Kleinhample's held at their house in Belgium. "Klein applied the perspective they acquired from past dinner clubs they hosted in their Antwerp studio and amplified it on a larger scale with Auburn, resulting in an intimate setting reminiscent of a well-appointed residence," said the restaurant in statement. The kitchen remains open to the dining area so that chefs at work provide the focal point for diners. Inside, the kitchen features a laser-cut steel hearth as its centrepiece. A pair of wooden shelves front the kitchen and are filled with crockery, resembling a storage cabinet in a home. Two wooden dining tables are set behind atop a rustic-looking rug, completing this homey set-up. Adding to this aesthetic is a neutral palette comprising roughly painted, muted walls, which aim to be "equally calming and energetic." Klein Agency custom designed the tables, chairs and lighting throughout the restaurant, creating a number of different setups. One area features a booth with peachy leather seats and swinging black wall lights above. Another section comprises delicate rocking chairs with supple seats, alongside wooden stools with a ridged top. These seats run alongside Auburn's wooden bar underneath a slatted skylight. Another resembles a private dining space, featuring chairs with black leather seats and more storage cabinets. Artwork topping these shelves form part of a series of works Berlin-based Eike König that Klein Agency chose to feature in the restaurant. Floor-to-ceiling windows run along the rear wall to bring in daylight and offer views to a small courtyard decorated with plants. Another feature of Auburn is the large outdoor terrace, accessed via glazed doors. Exposed ceiling beams cover both the indoor and outdoor areas to provide continuity between them, with both also featuring similar pale wooden furniture. Outside, a large opening is cut into the roof for a tree to grow through. The homey aesthetic is completed down to the details in Auburn, which include white oak serving trays designed by Klein Agency and simple plates. Other recently completed restaurants in the city include a Middle Eastern eatery, featuring interiors that are influenced by Morocco to Turkey. Photography is by Nicole Franzen.